In 1996 we started to outsource the production of our aquarium and pond accessories into China, since then we had the need to improve quality control and service and in 2003 we established Aquadistri China Manufacturing Co. Ltd. as a one stop supplier for all your pond and aquarium products manufactured in China. Aquadistri China is part of Aquatic Wholesale Group BV, an international group of wholesale and manufacturing companies in the aquatic industry, in 2011 Aquatic Wholesale Group celebrates their 25th years anniversary. Because of our long history, World Wide Activities and strong group performance we are a very reliable partner and understand your needs for quality and service. 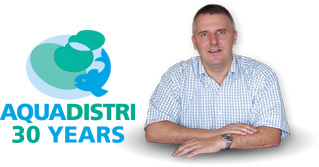 Robert Jan van den Enden, President of the Aquatic Wholesale Group is the managing director of Aquadistri China and oversees the design, production and quality process. Aaron Chong is our export and sales manager and will support you with all your questions and orders together with his office team. To manufacture high quality European standard products, with the benefit of lower labour costs manufacturing. We supply a wide range of aquarium and pond products, like water pumps, filters, air pumps, fish nets, cleaning equipment, please check out our Superfish brochures. Next to branded products we also supply, private labels, water tests, fish food, plastic plants and ornaments. Please contact our sales manager with your needs.